Athena’s Story: Cats Benefit from Hemodialysis, too! 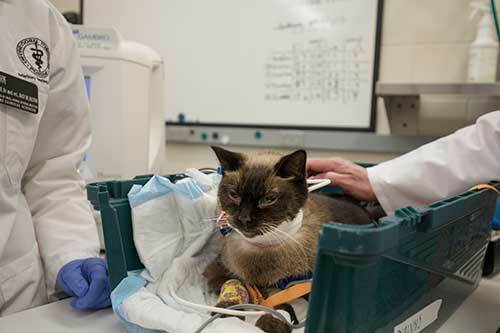 Meet Athena -- a nine-year-old Siamese cat, who became one of the Purdue University Veterinary Teaching Hospital's first feline hemodialysis patients. Athena had not been well for several days before she came to the College of Veterinary Medicine with signs of kidney failure. She was referred from her regular veterinarian in Crown Point, Ind., after an emergency clinic in Schererville, Ind. determined that she had very high kidney values, which made her feel nauseous and also caused her to have ulcerations in her mouth. On arrival at Purdue, Athena was found to be overhydrated, which means that she was accumulating fluids under her skin due to the inability of her kidneys to excrete enough fluids. "This is problematic, as it makes the patient uncomfortable but also can lead to further kidney damage," explained Assistant Professor of Small Animal Internal Medicine Sarah Steinbach. An ultrasound confirmed that Athena had a ureteral obstruction affecting her right kidney. "Unfortunately, her left kidney seemed to have impaired function as well leading to the very severe increase in her kidney values," Dr. Steinbach said. Athena needed surgery for placement of a subcutaneous ureteral bypass (SUB) system. That's where the hemodialysis comes in. Athena's internal medicine team of Professor of Small Animal Internal Medicine Larry Adams, Dr. Steinbach and Nephrology/Urology Technologist Julie Commons knew that hemodialysis helps stabilize patients such as Athena prior to having surgery. "Hemodialysis allowed us to remove toxic waste products from Athena's blood to make her feel better," Dr. Steinbach said. "Most animals will show an improvement during their first treatment. Furthermore, it also allowed us to remove the dangerous excess fluids that had accumulated." Athena received two hemodialysis treatments prior to having surgery. "Her kidney values decreased by more than 50% after hemodialysis and she was a stable surgery patient, making it possible to place a SUB, which is essentially an artificial ureter," Dr. Adams said. "The SUB consists of a catheter surgically placed into the renal pelvis of the kidney and another catheter surgically placed into the bladder. Both of these catheters are then connected to a port, which is implanted under the cat's skin. This SUB allows urine to flow directly from the kidney to the bladder." The port also can be used to flush the system to keep it open and to get urine to check for infections. Dr. Steinbach said the surgery went well and Athena is back home with her owner, Courtney Bargfeldt, after nine days of hospitalization. "Athena is a very sweet cat and we are looking forward seeing her again for her re-check appointments at Purdue." 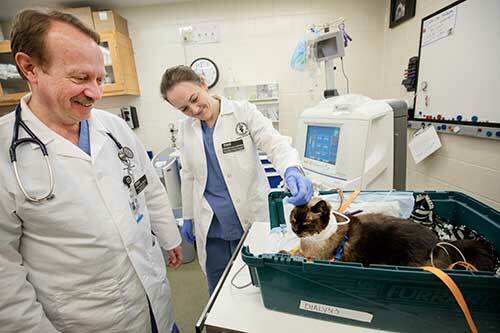 A Siamese cat named Athena is one of Purdue Veterinary Medicine's first feline hemodialysis patients. Athena undergoes hemodialysis under the expert care of her small animal internal medicine specialists Larry Adams and Sarah Steinbach.